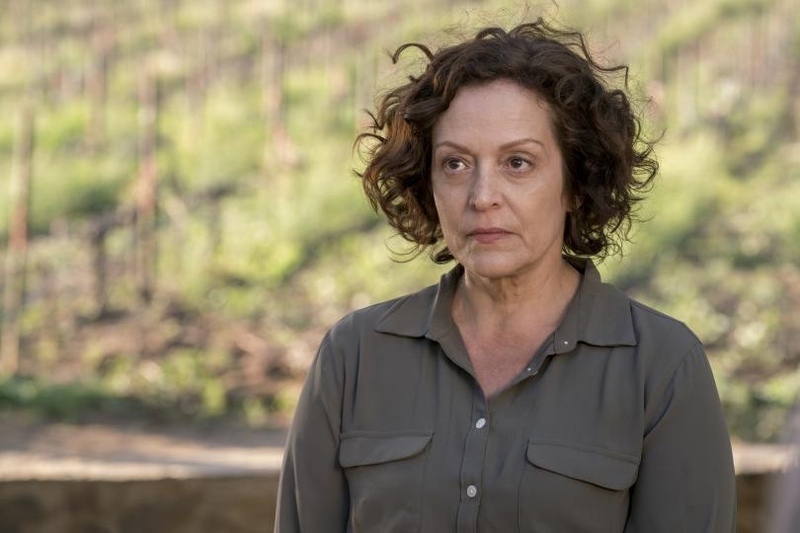 Marlene Forte plays Celia Flores – the main antagonist in the mid-season finale of “Fear of The Walking Dead”. Celia Flores is a survivor of the outbreak and an antagonist encountered in AMC’s Fear Of The Walking Dead. She is the mother of Luis and the main antagonist of the first half of Season 2. After Decades in the industry, Forte is one of those familiar faces to which you’d have trouble putting the name. Yet you’ve seen here everywhere simply because she’s played them all. In fact, her work reads like the ultimate directory of television – from “Crossing Jordan”, “The George Lopez Show”, “The Mentalist”, “Law & Order”, “Bones”, “Daybreak”, “The West Wing”, “ER”, “Lost”, “Castle” to “House of Payne”, “24”, “ Community”, and “The Secret Life Of The American Teenager”, among many others. Of course, her recurring role in TNT’s relaunched “Dallas” playing Carmen Ramos has made her even more recognizable and admired and so will her character Celia Flores in AMC’s “Fear of the Walking Dead”. On the movie side, she played the transporter chief in the 2009 JJ Abrams’ “Star Trek” reboot; Mrs. Glass in “Real Women Have Curves”; and the unforgettable Pilar Brown in “Our Song” opposite Kerry Washington (“Scandal”). She appeared recently in the Marlon Wayans’ parnormal’esque parody “A Haunted House”, and Tyler Perry’s “A Single Mom’s Club” (her second time working with the award-winning director). When Marlene turned 30, she decided to become an actress. That’s a late start for most occupations; in Hollywood it’s nearly unheard of. But for Cuban born girl named for one of Tinseltown’s brightest stars (Marlene Dietrich) perhaps the journey was predestined. It started in Havana, Cuba, where Forte was born. When she was 9 months old, just as Fidel Castro’s regime began to take hold in the late 1950s, her family moved to New York City. When Forte was 3, they moved to heavily Cuban Union City, and later to West New York and then North Bergen. She studied at Fairleigh Dickinson University in Teaneck as an English major and completed graduate work at Montclair State University to become a teacher before deciding in the mid ’80s to get into acting. She had always wanted to, but it seemed too unstable a career path for the oldest daughter in an immigrant family, a young mother who had married and later divorced her high school sweetheart. As her star fast-steadily continues to rise, so are the accolades. Last year, The Hispanic Organization of Latin Actors (HOLA) – the nation’s longest running active arts advocacy organization for Latino actors – honored her with a HOLA Award for “Excellence in Television”. Most recently she received a “Pioneer Award” at the 2014 Reel Rasquache Art & Film Festival and an “Artist Award” from Union City. Today Marlene Forte is still doing it all. She continues to do shorts and live theater, to work on web projects (notably the Imagen Award winner “Ysle” with Ruth Livier), to tackle indie films and big budget movies, and pop in some of TV’s high-profiled series and sitcoms, including the cult-classic international smash “Dallas”. And as she is keeping that acting bug rolling and the roles coming, she most definitely provides a shinning example of how women can “make it” in Hollywood on their own terms. This entry was posted in Interviews, Podcasts and tagged amc, cuba, fear the walking dead, marlene forte, walking dead, zombies. Bookmark the permalink.